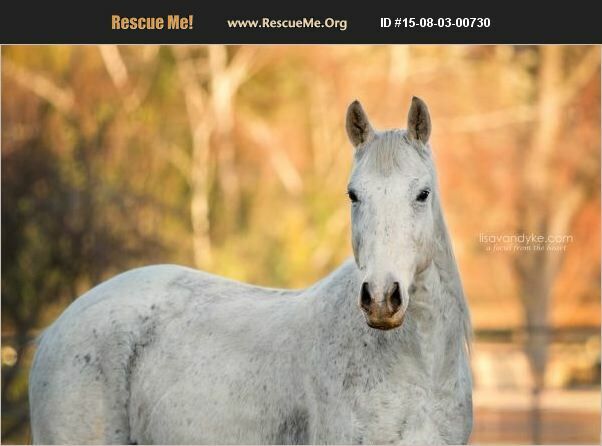 California Horse Rescue View other Horses for adoption. AAE took in this handsome TB gelding in November 2013 after relinquishment by his owner resulting from a financial distress situation. He loaded easily when we picked him up. He seemed to be an absolute gentlemen, and we were told he was an ol' trail horse. He was very thin and suffering from a respiratory infection/mild pneumonia. Smokey received a visit from Dr. Stolba, and he was placed on antibiotics while in quarantine. Smokey truly is a kind ol' soul, but he does have a few quirks that need exploring and work. Some days he meets you at the gate, other days, he'd rather be alone and plays hard to get. Those times are fewer and farther between, but still a part of his day. Working in the round pen is not something he enjoys, and he didn't seem to have much understanding of anything but 'go'. However, he's made great progress. He readily accepted a bit/bridle, and he stood pretty quietly while saddling, with no resistance. However, as his rider's leg went up and over to mount, he bolted. Radiographs of his withers area indicated an old fractured vertebrae with a piece of bone that migrated back a couple vertebra in his shoulder area. No wonder, he was trying to escape pain. Based upon the location and saddle placement, a saddle is likely a source of substantial pain. As a result, Smokey will be best suited as a companion. He also has multiple melanomas under his tail, and a sarcoid in his inguinal area. He is current with vaccines, deworming, and dental care, but his hooves are still a work in progress. He manages them well, but does not do well with hoof trimming, possibly due to his shoulder issues. Adoption fee subject to change based on training. Please see website for current information.